Once upon a time, there was an editor with a fascination for the Tarot.�She was struck one day by a crazy idea. "Hey," she said. "What if twenty-two writers each wrote a story about the twenty-two cards of the Major Arcana of the Tarot and were fashioned into an anthology?" The idea would not leave her alone. And thus, the Allegories of the Tarot was born. Crowdfunded by a campaign on Indiegogo with the help and support of an amazing group of writers, twenty-two stories were crafted around the mysteries of the Tarot. The group includes a Pushcart Prize nominee, a Pulp Ark nominee, a former Bigfoot researcher, a journalist, an award-winning YA author, and a Rhysling Award winner. Professional writers, new talent, and a range of genres boggling the mind:�Horror, Speculative Fiction, Bizarro Fiction, Erotica, Mystery, Humor, Paranormal, Epic Fantasy, Literary, Romance, and Historical Fantasy. What has emerged is an outstanding collection of fiction, unique and mysterious. Stories that will make you cry, make you laugh, and make you think. Stories that make you feel the touch of the Universe. Dare to step through the portal to shadowy realms and emotional journeys. Allegories of the Tarot is available in e-book and paperback format on Amazon, and in multiple e-book formats on Smashwords. 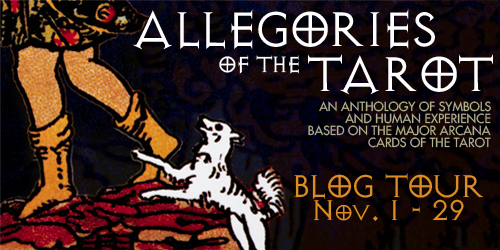 Don't forget to add�Allegories of the Tarot�to your to-read shelf on Goodreads. Connect with the�Allegories of the Tarot�Anthology on its�website,�Facebook, and�Twitter.